This web page is dedicated to the accomplishments of Lyndon Lamborn and his dealings with the Mormon Church. Lyndon Lamborn was an active member of the LDS Church until he was excommunicated on August 19, 2007 for apostasy. 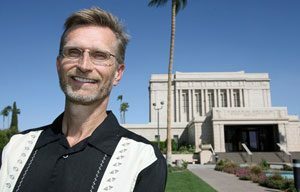 Newspaper article: "Mormon ousted as an apostate"
Follow-up Article: "Mormon leader declines to announce ouster"
Third Article: "Faith, conflict and excommunication"
Book authored by Lyndon in 2009: Standing for Something More. Available at Amazon. Our Review: I just finished reading Lyndon Lamborn's book Standing for Something More. I really liked the book. The author has a very nice tone in his writings. This is not an 'anti-Mormon' book by someone with an axe to grind against Mormonism but rather tells the true story of one man's very interesting experiences with the Mormon Church. The Mormon books written by former members have really been lacking a psychological examination of why intelligent people remain in the LDS Church after finding out many things that indicate that the church may not be what it claims to be. I found it particularly useful as I am an active Latter-day Saint. I like that he alternates chapters detailing the psychology implications of church membership with his own personal story. I haven't seen the emotional and psychological aspects of membership in the Mormon Church presented in a simple, clear, concise manner before as Lyndon does. Also it's not written in a critical manner but Lyndon is very honest and not hiding anything that he did or that the church has done. The book does list some serious problems with Mormonism which he describes in a very intelligent manner that may make a believer rethink his beliefs. Mainstream Christianity is also touched on in a constructive manner as he explored that option when he left Mormonism. Basically it's just not the same old ex-Mormon stuff. It's a needed fresh look into Mormonism in the 21st Century.